I seriously doubt that very many people of today understand and appreciate all of Jesus’ teachings in this statement. I am sure that I do not. Sheep, shepherds, security of the flock, the relationship between a quality shepherd and ancient flocks, and sheep cotes are just not a part of our background. There are some lessons in this statement that would have been quite obvious to Jesus’ audience that are not obvious to us. It simply means we have to be open and try harder to understand. 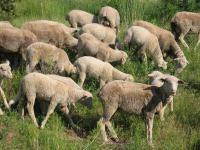 The relationship of a quality shepherd with his flock of sheep was centuries old. The image of a shepherd fit Jesus’ work and mission in many ways. I find it fascinating that Jesus did not compare his earthly mission to the work of the wealthy, but to the work of a shepherd. To us, the role of a shepherd was a noble calling, but not so even to Jesus’ world. In scripture the image of a shepherd is used both metaphorically and actually. God is called Israel’s shepherd stressing the truth that they were “in good hands,” had no reason to be afraid, but had every reason to be a people of faith. Rulers are called shepherds of their people emphasizing their responsibility to care for those whom they rule. For centuries in the ancient world wealth was measured in livestock–flocks and herds. There was no stock market as we know it, no banks as we know them today; no financial institutions as we know them today; no forms of investments as we know them today. A person’s wealth and financial well being commonly was measured in what he actually possessed, what was actually his at the moment. He might own a lot of sheep (and other livestock as well), but he could not be their actual shepherd–and likely had no desire to be. So he had to hire someone for the job, someone trustworthy he could depend on. However, he likely only knew what he was told. The key would be if the man hired had primary interest in the sheep given into his charge or in himself–would he care for the needs of the sheep, or would he use the sheep to prosper himself? His flock would be small–he would not own many sheep. Yet, each sheep was critical to the family’s well being. Shepherding usually fell as a job done by a family member. While it was an extremely necessary job–the sheep had to be constantly fed, watered, and cared for–it often was a very undesirable, lonely job. Let me ask you to consider the work and life of a shepherd. First, let me ask you to consider a shepherd’s work. Remember, there are no barns, no special equipment, no pastures as we know them today, no fences–thus there are no prepared, protected places to fed the sheep in secure circumstances. Sheep, like most livestock, have to be fed and watered every day–there are no vacation days or comp days for a shepherd. Every day all in the flock need to be examined. Who is sick? Who is weak? Who needs treatment? Who needs help and special attention? Yet, the shepherd needs to know more than where he or she can take the sheep to graze and be watered; he also must be the sheep’s security. If one of the sheep gets lost, he must find a way to make the rest of the flock secure and go find the lost sheep. If the weather turns cold and wet, he must find shelter for the sheep. At night, he must find a secure place for the sheep to stay–with the only way to the sheep through him! If a sick sheep is too weak to walk, he must help it or carry it. If wild animals are near, only he stands between the danger and the death of the sheep. It was a very “hands on,” demanding, dirty, dangerous job. It was not the occupation any of us would aspire to! Second, just think about how lonely that job would be! Understanding that the key question was, “How important is the sheep’s well being to me?” and understanding that shepherding was a dirty, demanding job, focus on what Jesus said in the first part of John 10. There were occasions when it was necessary to take your flock temporarily to a public sheep cote (enclosure) where several flocks might be present in order to provide temporary security for your flock while you took care of something essential. These enclosures had one way in which also served as the only way out. It had a keeper of the door (entrance) who permitted only shepherds with flocks in the enclosure to enter the enclosure. Jesus said he had a relationship with his sheep–they were not merely dumb animals he had to care for. He drew a obvious contrast–a shepherd goes in at the entrance; a thief seeks another way in. The sheep knew the difference between the unfamiliar thief and the familiar shepherd! With the thief, the sheep sense danger! With the shepherd, the sheep sense security! The sheep knew the shepherd’s voice, and would follow that familiar voice and only that familiar voice. Though the people who heard did not understand the meaning of what Jesus said, he was declaring he cared about them above all else. He was their security because of his unselfish interest in them and their well being! They had nothing to fear from him! He was of no danger to them! The analogy Jesus’ made in verses 7-10 still focused on the shepherd and the sheep. Because they did not understand his point previously, he used the same analogy with a different comparison. This time he compares himself to the door of the sheep cote. Those who came to the people of Israel before him claiming to seek the people’s best interest were not concerned about the people but their objective. These previous people who claimed to speak for God were people who exploited–but not him! He did not seek to use them, but to give them security! If the people wanted to have the security God promised, they must (a) recognize who he is and (b) approach security through him. They need to ask themselves a question and pay attention to the answer: do people who call for you to follow them want to use you or give you security? Others come to exploit you. I come to give you life in its fullest sense. The emphasis is the same–he is the source of their security and seeks to provide for their security. The contrast that follows is the contrast between a good shepherd who cares about the well being of his sheep and the hired shepherd who accepted a job, but not responsibility. 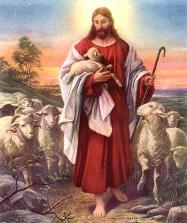 Jesus was a good shepherd who would willingly die for the well being of his sheep. Would not put his life on the line to protect the sheep. Instead, at the first sign of danger he would run. He would put the lives of the sheep in danger instead of putting his own life in danger. The sheep meant nothing to him! They certainly were not worth dying for! In contrast, Jesus is the good shepherd who is totally committed to the well being of his flock. He personally knows his sheep. His sheep personally know him. He would not hesitate to die to protect his sheep. There are other sheep in another flock that are his sheep–he had sheep among the gentiles just as certainly as he had sheep in Israel. The moment would come when he would combine flocks. He would be the shepherd over this one flock of Jewish followers and gentile followers. God loved him because he cared about all the people who belonged to God. He would die for all of them. However, his death would not be permanent. His life would not be taken from him against his will–he would of his own decision die for the good of all God’s sheep. He could choose to give his life for the security of the sheep. He could choose to live again. This would happen because of the will of God. His words caused a serious division in his Jewish audience. If Jesus is who He said He is, live for Him. Only He is your security!